Fred Schubert is a retired physician with both writing and teaching experience during his professional career, reaching back to 1983. Since 2009 he has been writing periodic articles on general science for his local newspaper, "The Dalles Chronicle." Schubert holds a Bachelor of Arts degree in biology and a M.D. from the Oregon Health Sciences University. Recognizing that you’re anemic can be challenging. Symptoms are often subtle or vary with the underlying cause. At the same time, your body is capable of adjusting amazingly well to slowly developing anemia to further mask its signs. Anemia means that the number of red cells in your blood has dropped below normal, or the amount of hemoglobin in each red cell has become too low. Your bone marrow produces millions of red blood cells every day, constantly replacing older ones in the bloodstream that are removed for wear and tear or because of normal slow losses such as menstruation. Every normal red blood cell contains abundant hemoglobin, the oxygen-carrying protein that requires a regular supply of iron in your diet for normal synthesis. There are many causes of anemia, some of which are overlapping, including iron deficiency, bleeding, vitamin B deficiency, malabsorption, bone marrow failure, medications, viruses, immune disorders, chronic diseases and inherited disorders such as thalassemia and sickle cell anemia. Whatever the underlying cause, anemia results in less oxygen being delivered from your lungs to your muscles, heart and other organs. This decreased oxygen supply leads to the signs and symptoms of anemia. Recognizing slowly developing or mild anemia can be nearly impossible on your own. Many cases of anemia are discovered only incidentally on laboratory tests performed for some other reason. As anemia worsens, you may begin to notice symptoms of fatigue, lack of energy, shortness of breath, headaches, dizziness, problems concentrating or cold hands and feet. Some of these symptoms might occur only during exercise at first but can appear even at rest as your blood counts continue to drop. Anemia is a common disorder affecting all ages and groups of people, but your risk of becoming anemic is greater if you are on a limited diet low in iron or other vitamins, have a reason for blood loss like heavy periods, are pregnant or have a chronic disease such as diabetes, kidney disease or cancer. Contact your health care provider if you suspect you might be anemic. Because the symptoms of anemia are often mild and non-specific, and everyone feels tired or struggles with concentrating from time to time, confirming the presence of anemia requires medical evaluation. A detailed medical history will help uncover possible risk factors for anemia such as a family history of anemia, certain medications, chronic infection, intestinal disorders or dietary issues. The physical examination can confirm some of your symptoms and reveal additional signs such as pale skin, a rapid irregular heart beat or a new heart murmur caused by the heart working harder to supply oxygen to your tissues. Confirming a diagnosis of anemia starts with two common laboratory tests. A complete blood count, or CBC, involves multiple measurements on the same sample of blood, including the number of red blood cells present, along with their size, shape and the amount of hemoglobin each contains. Based on these results, a laboratory technologist might then examine a thin smear of a single drop of blood under the microscope to look for other cell changes that could help in further diagnosis. 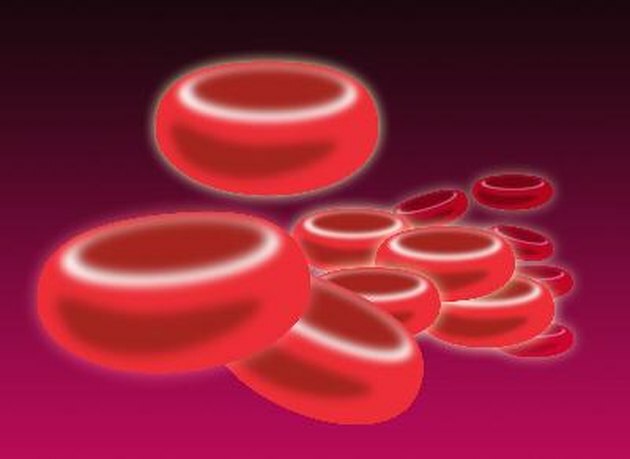 Dividing anemias into a few broad categories based on the red blood cell size and hemoglobin content allows your health care provider to more quickly narrow down the list of possible causes for your anemia. Additional focused testing should now be performed, since the discovery of anemia simply indicates an underlying problem with red blood cell production, bleeding or some other cause of red cell loss. Iron and ferritin blood levels, vitamin levels such as B-12 and folic acid and rate of red blood cell production are all commonly ordered tests based on the findings from your history, physical examination and initial laboratory tests. A more extensive look for underlying chronic diseases or undiscovered bleeding will be necessary if a simple explanation such as diet or pregnancy can’t be found. Although anemia is a common and often easily reversible condition, it can also be the first sign of a more serious disease such as an immune disorder or cancer. The treatment and long-term outlook for a diagnosis of anemia depends on the underlying cause. It can be as simple as making changes in your diet or taking vitamin supplements for a short period of time. Other causes may require long-term medications or more aggressive treatments to attempt to control or eradicate whatever disease has resulted in your anemia. Successfully taking charge of your anemia requires being aware of its possible symptoms, following the necessary steps for diagnosis and seeking help promptly.